How extreme? Only in that it was hot, Hot, HOT!!! My goal was to hit the Mineral Wells Trail no later than 7:00 am; because the other person involved in this adventure is a teenage boy who needed his beauty rest, we didn’t actually hit the trail until about 8:45. Mile 24 or so...Feeling Better in the Shade! Overall, it was amazing!! We biked 26.5 miles. I was really struggling on the way back, having to stop, rest and drink every fifteen to twenty minutes. I was really surprised at how the heat affected me. I mean, I do ride every day (except last week!) in the heat. Not quite that long of a ride, though, and it has been hotter this week. Temperature as we left the trail today was 98. Ouch. Biggest Lesson learned today is that I need a camelback. Water bottles just don’t hold enough water for long rides like this. Second lesson learned is the importance of fueling. I didn’t load up last night with carbs, and I didn’t carry any snackage onto the trail with me. I think I would have done better on the way back if I had refueled at the halfway point. The Architect? Didn’t bother him at all! Can we bottle TeenAge Boy Energy and sell it? The Architect - Show Off! Tracking food and exercise consistently and honestly – Done! Even the donuts and the cake. In fact, that day will show up next week with a whopping 55 points in one day. Whoa! Stay within my daily point allowance – I’m keeping up with the eating, making sure I’m getting plenty of fuel, as well as a wide range of vitamins and minerals. Water..lots and lots of it. It was 112 yesterday afternoon. Earn a minimum of 50 activity points a week – I missed this one for the first time in a while. It was just too hot, and I let other things take necessary priority. It happens. Today’s ride should make up for some of it this week. Exercise adds up over time, as well as healthy eating. No quitting? No brainer. I haven’t quit yet! Supporting fellow challengers – I continue to pray daily for our entire group. I checked in, left notes and cheered on the crew! You are so faithful to your fellow bloggers. Thank you for the prayers and all your comments I read at others’ places. Your support and encouragement is priceless. Those donuts can get us in trouble. There are some things that just cannot be in the house. Hopefully this week will find less of you around here! If you do figure out how to bottle that teenage boy energy, sign me up for a lifetime supply! You’re doing a great job! And thank you so much for continuing to pray for our success! It really means so much! Love, love, love the fact that you were out cycling with that teen age bike wiz! good for you!! 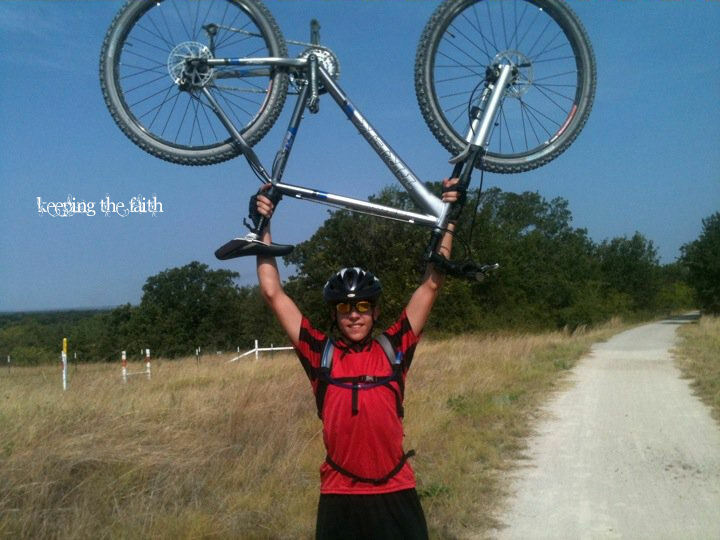 26 miles is no small feat. So, congratulations on your determination to just do it. Looks like you had a GREAT week. Hopefully next week will be a great loss! Wow! 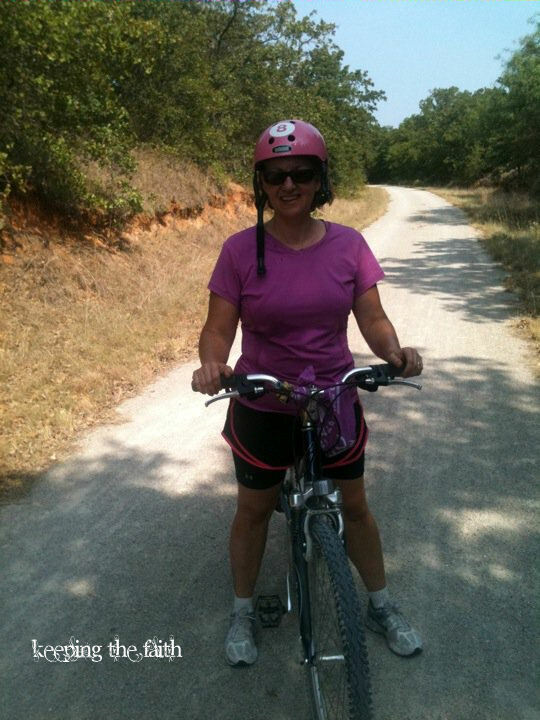 Way to rock that bike!! I’m in awe! You’re doing great! Looks like the biking trail is beautiful. I wish we had some nice trails around here. 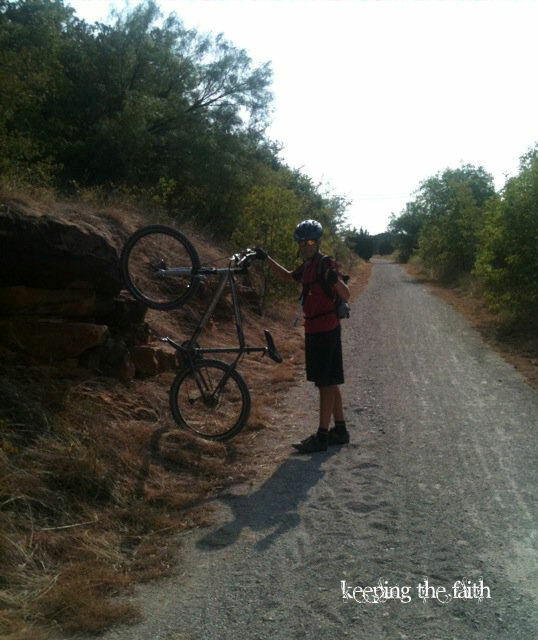 You are a trooper to get out there & bike in 98 degree weather and your son… dang! Tell me that pic of him lifting the bike over his head was before the ride at least?? If not then please work on that bottling and ship some my way! You’re amazing. Anything over 80* and I stay indoors! Biking in high 90’s, that’s impressive! Just think what you burned just in sweating alone! Add in the burn from the actual bike ride, huge calorie/fat burning! !